The following is a brief guide to each of the the stadiums in the Sunflower League, including my take on each of the facilities. The league is fortunate in that five of the seven stadiums have been built within the past 10 years. 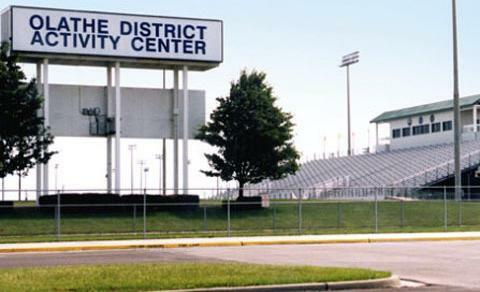 About: Built in 2004, the stadium is adjacent to Olathe Northwest's campus and acts as the home stadium for both Olathe Northwest and Olathe East. Perception: From a fan's perspective the stadium is easily accessible, located at the corner of both K-7 and K-10 highways. As a player the grass always seemed longer than what we practiced on and you felt a bit slower on its surface. The locker rooms are spacious and set up well to accommodate both home and away teams. The stadium is still relatively young and located in a developing part of Johnson County, so it doesn't really have a nostalgic feel, but nonetheless it's a beautiful facility in a budding part of Johnson County. About: Built in 2009, the beautiful brick stadium sits on west side of the LHS campus and rests literally just a stone's throw south of the heart of the University of Kansas. It is the exclusive home of LHS. Perception: The stadium is gorgeous and and fits well into the quaint neighborhoods that surround the University. I never played in the stadium so I can't say as to its feel or locker room accommodations. The only downside is that the brick facade and seating doesn't help illuminate noise like aluminum bleachers do, so the facility seems relatively calm compared to many of the other stadiums. This was probably an intentional caveat to allow construction of the stadium in such a dense part of the city. About: Built in 2009, the stadium is gently seated on the northwest side of the Free State campus. Probably 90% of the stadium sits below ground level, and it has a brick facade similar to Lawrence High Stadium. 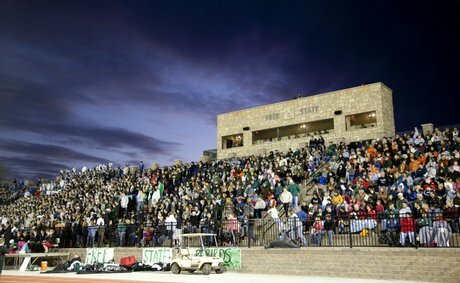 The stadium is the exclusive home of Free State. Perception: My limited knowledge with the facility is that it really is a beautiful structure and it's neat the way it sits below the surface of everything else in the area. The only drawback is the lack of noise derived from the brick facade (see Lawrence High Stadium) and the lighting. For some reason the stadium seems dimmer than most facilities and I'm not sure if that's because it's on the edge of Lawrence or because the lighting is just less intense. If you're traveling to a game at Free State plan on leaving a bit earlier than the standard 30-minute drive down K-10. The stadium is located on the very northwest edge of Lawrence and there's really no direct route to it besides cutting through the city of 95,000. About: I have no idea when ODAC was built but I would venture to say late 1980s or early 1990s. The stadium acts as the home facility for Olathe North and Olathe South. Perception: Located just south of the crossroads of I-35 and 151st Street in Olathe, the facility sits amidst cornfields in an area of the county this is yet to be completely commercialized. For me, it's hard to think of the stadium without conjuring up memories of the great Olathe North dynasty teams. If you're playing at ODAC you know you're in for a battle because Olathe North and Olathe South are seemingly always talented and an even tougher draw at their home stadium. The locker rooms are quite spacious but the walls are paper thin and with locker rooms that sit back-to-back it gets interesting. ODAC's grass surface seems to give you more torque for movement than CBAC's, but maybe that was just my own perception. As a fan, its proximity to I-35 makes it an easy location to get to from anywhere. The facility is well taken care of and it's a fun place to watch a game of football. About: Built in 2010, Pioneer Stadium sits on the southwest side of the Leavenworth High campus and is flanked on its west side by a lush canvas of woods. It's the exclusive home of Leavenworth. Perception: Leavenworth's old stadium, Abeles Field, was an older facility (built in 1923) so I don't want to be too hard on it, but that place was a dump. The field had a sand base that was bad to play in and you could smell the stench of the nearby Missouri river from the away stands on certain humid nights early in the season. It was a blessing that the city of Leavenworth came up with the money for a new facility, which happens to be a gem. The stadium has aluminum seating and is basically the standard for what new high school football stadiums look like--as in it's a very aesthetically pleasing complex. A welcomed change from what anyone who attended a game at Abeles Field in Leavenworth experienced in the past. About: In 2005 the original SM North Stadium (built sometime in the mid-20th century) was demolished to clear the way for a new and improved structure. The new stadium was completed for the start of the 2006 season. Seated on the south end of the SM North campus, it acts as the home field for SM North and SM Northwest. Perception: It's a beautiful stadium planted at the corner of Johnson Drive and Metcalf, which makes accessibility relatively easy for fans. The stadium's architecture does a good job of conveying the sort of charm you get in the northern Johnson county suburbs of Merriam, Roeland Park and North Overland Park, and the stadium is surrounded by dense tree growth. From a player perspective the field is great and the tall press boxes are good at blocking out the setting western sun. The primary problem is the cramped locker rooms for both the home and away teams. The old stadium had even smaller locker rooms so when the new stadium was built everyone assumed the new ones were apt to be very large. Not the case. Cramming a varsity team of 60 or so players into the locker rooms is rough, and barely manageable. Still, the stadium is well-built and and an awesome setting to watch a game if you get the chance. About: Built sometime in the 1970s, I would presume, the stadium is seated on the west edge of the SM South campus. It's the home stadium for SM South as well as SM East and SM West. Perception: The stadium is not fancy, new or well equipped for media members, but it has the largest capacity of any stadium in the league and it remains a fan favorite. 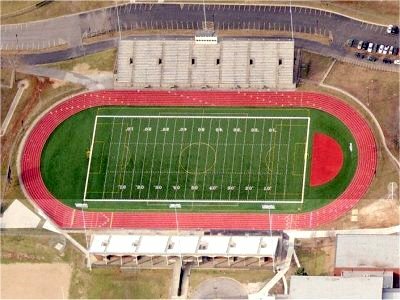 Located close to the intersection of Nall and I-435, the stadium and high school sit on a sort of crowned plateau in east-central Johnson County. From the playing field (and from the top of the home stands) you can see miles in various directions which is pretty cool, and there's also not a bad seat in the house. Renovations prior to the 2006 season established new home and away locker rooms next to the stadium, connected to SM South. The locker rooms are massive and arguably the nicest of any in the league. It's a solid facility for players and fans alike. 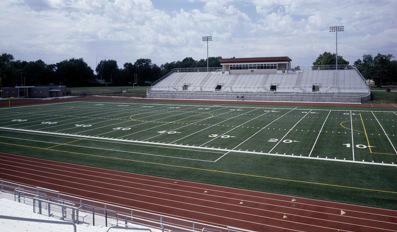 I'm surprised that Leavenworth stadium is larger than both the Lawrence stadiums. The vistor side of Leavenworth seemed really small. Some great stadiums. The Lawrence stadiums take on an old style feel with the stone work. SMN stadium maybe my favorite to watch a game, but the parking is really tight. I would love to see ODAC and CBAC convert to turf. ODAC and CBAC both too low to the ground not good viewing angles. I still think the best place to watch a game is good old SMS stadium. They just don't build 'em like that anymore. I'll tell you this much, the best press boxes are SM North's and CBAC's. I agree that the Olathe Stadiums need turf. Makes for a much faster game.